If there is one thing that your garden should be, it’s relaxing. A home with a garden in the back is a lucky one indeed, as there is a little piece of land there for you to make your own. You get a chance to make your garden exactly as you would like it. If you have children, you’re likely to make it safe, brightly coloured and full of activities that children can spend time on. If you are retired, it’s likely that all you want is a comfortable bench and a space to view the flowers that you choose to plant. Food always seems to taste fresher when you take it outside to eat it. Setting up a dining area with the perfect table and chairs outside can give you somewhere to sit back and relax. Balance this on a patio area if possible and try and put it all in an area that catches the sunshine. You may think of lighting as an indoor concept, but if you want to enjoy yourself outside, then you should consider solar lighting that’ll brighten up at just the right time. When the twilight begins, the lights come on, creating the right mood. If you plan to have a garden full of perfectly pruned flowers and trimmed bushes, mowed lawns and an outdoor kitchen, you need to plan to maintain it. Greenery won’t weed itself, so either you could go online and work out how to do it all for yourself, or you could bring on a company that can do it for you. 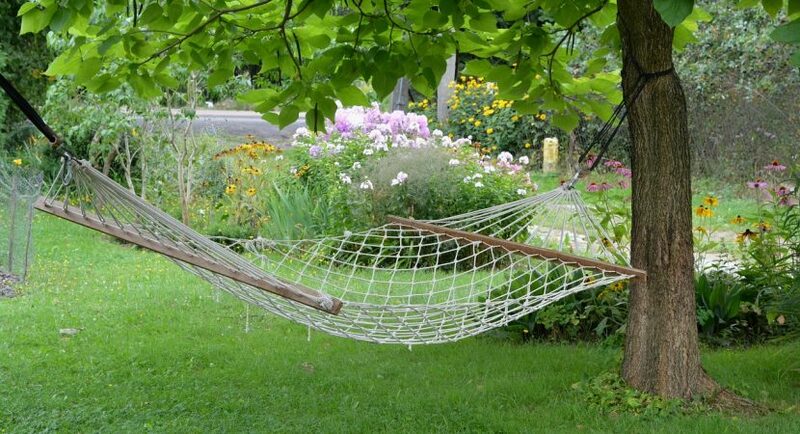 Every garden needs a place to sit, and while some are happy to spread out a blanket and lounge in the grass, others prefer a hammock or hanging chair to relax into. Hammocks are an amazingly comfortable option and are a must-have if you want to just while away the hours with a good book as you sway in the wind. Your garden should be as relaxed as possible and if you can have the budget to make it as beautiful and as peaceful as you’ve always imagined, then you should make it so.